From left: Bob Stepto (President of the Polymer Division), Pavel Kratochvil, Leiv Sydnes, and Jung-Il Jin (Vice President of the Polymer Division) pose after Kratochvíl accepted the IUPAC-Samsung Education Prize from IUPAC President Sydnes. At the opening ceremony of the 43rd IUPAC General Assembly, held in Beijing, China, in August 2005, IUPAC President Leiv Sydnes presented to Professor Pavel Kratochvíl the 2005 IUPAC-Samsung Education Prize for the Postgrad-uate Course in Polymer Science that he founded in 1996 at the Institute of Macromolecular Chemistry at the Academy of Sciences of the Czech Republic in Prague. Since its establishment, the course has acquired a worldwide reputation for its high standards and effective training of students in polymer science. The award of USD 5 000 is to assist a deserving student and will contribute to Samsung’s goal of stimulating polymer education and research in the world. The award is managed by the IUPAC Polymer Division Samsung Fund Committee and is part of the generous donation Samsung made to IUPAC in 2003 to help stimulate polymer education and research in the world. 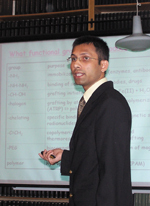 On 21 July 2005, the ninth run of the UNESCO-IUPAC Postgraduate Course in Polymer Science was concluded by a public seminar, at which 9 graduates reported the results of their research carried out during their 10-month stays at the Institute of Macromolecular Chemistry at the Academy of Sciences of the Czech Republic in Prague, Czech Republic. The institute, with a staff of 240 and more than 100 scientists, is one of the major centers of academic research in polymer science worldwide. For almost 40 years, the institute has been educating young scientists from countries with limited facilities for up-to-date research. The present series of courses started in 1996 under the sponsorship of UNESCO. A few years later, IUPAC granted its sponsorship. The course is financed by the institute and academy, with occasional contributions from IUPAC or UNESCO. The course lasts 10 months and comprises about 50 hours of lectures in modern polymer science and also an introduction into the nomenclature and terminology recommended by IUPAC. However, the students spend most of their time in laboratories working on research projects under the guidance of senior scientists of the institute. They are also invited to participate in seminars, conferences, lectures of visiting scientists, and other educational activities within the institute. At the final seminar after defending their reports, the students receive a certificate of graduation with UNESCO and IUPAC logos. Follow-up surveys with graduates have shown that the course has been very helpful to their professional promotion in their home countries. The institute continues to cooperate with a number of graduates through joint projects with their home laboratories. So far, 72 young scientists from the following countries have graduated from the course: Bangladesh, Bulgaria, India, Kazakhstan, Poland, Romania, Russia, South Africa, Ukraine, and Uzbekistan. The results of students’ research have been published in international technical journals and presented at conferences. As of May 2005, students have had 87 papers published in international journals and 91 contributions at international meetings. The 10th course started in October 2005. The admission procedure for the 11th course, to be held in the academic year 2006–2007, will take place in March 2006. Page last modified 24 October 2005.